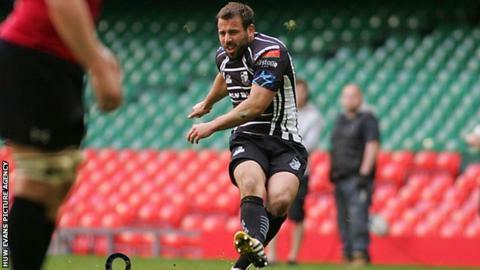 Pontypridd won the Swalec Cup for a second successive season with a hard-fought final win over Cross Keys at the Millennium Stadium. The Premiership winners scored tries through tight-head James Howe and centre Gavin Dacey. Fly-half Simon Humberstone contributed 11 points with a conversion, two penalties and a drop-goal. Cross Keys scored a try through Nathan Trowbridge with fly-half Dorian Jones kicking a penalty. Keys had a late try disallowed for a knock on, and saw full-back Steffan Jones miss four kicks at goal. Merthyr earlier held out in a dramatic Plate final to beat Rhiwbina 29-26 at the same venue. Rhiwbina's Brett Chatwin and Sion Summers scored early tries, but Merthyr's power gradually told with Gareth McCarthy adding the conversion. Owen Morgan, Josh Flye, Osian Davies and Gareth Way hit back for the Ironmen and Steve Lang kicked a conversion. Louis Miller and Chatwin, going over for his second try for the Squirrels, took them back to within three points and that is how it stayed. Clwb Rygbi Cymry Caerdydd beat Llantwit Major 16-10 in the Bowl final that kicked off the knock-out showpiece. Oliver Jenkins kicked two penalties and Paul Davies went for their try, converted by Jenkins who went on to add a third penalty. Llantwit prop David Taylor scored their try with Ryan Evans converting and kicking a penalty.